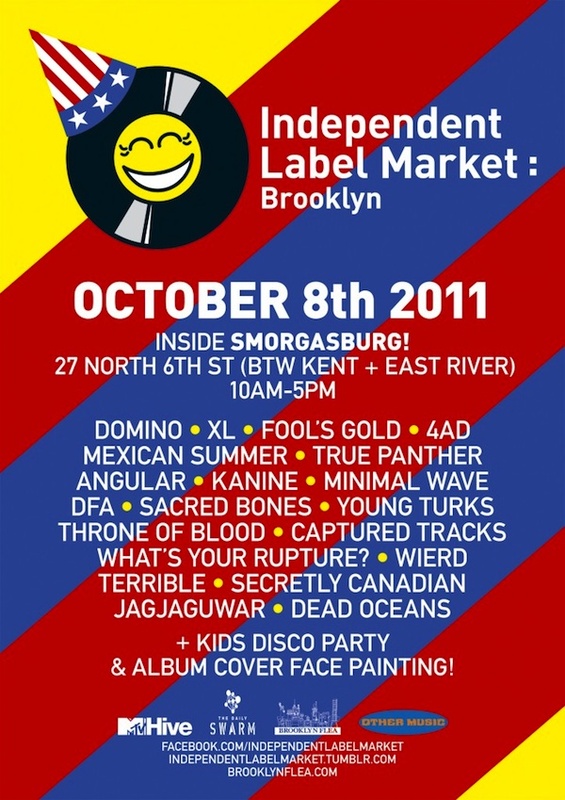 Brooklyn Flea’s 4th annual Superstar DJ Record Fair will take place this Sat., Oct. 8, inside the Flea’s Smorgasburg food market on the Williamsburg waterfront. It will feature about 20 vintage record dealers, plus 20 vendors as part of the Independent Label Market, which launched in London in May and is making its US debut at the record fair. ILM features top labels from the world’s best music cities, with the heads of those labels manning the booths, selling their own products—new, catalog, rarities—at this unique and intimate new format for record-buying. This year’s record fair will also include a kids’ disco party, with ourselves – Mister Saturday Night – taking care of musical duties. Then label owners and special guest artists will take spins on the open turntables for the remainder of the event. Among the folks and labels selling are… 4AD, Captured Tracks, DFA, Domino, Fool’s Gold, Jagjaguwar, Kanine, Mexican Summer, Minimal Wave, Secretly Canadian, Throne of Blood, True Panther, XL, Young Turks, EAT Records, Halcyon, Us (yep, you can buy records straight from Justin and me), Neurotic Drum Band (our friends Ulysses and John Selway), Piotr Orlov, Sound Fix, Doug Mosurock and John Allen. Come by records from us, and bring your kids to get down.